WHOA! Hello one month away from being one. I don't think I'm ready for my baby to not be a baby anymore. 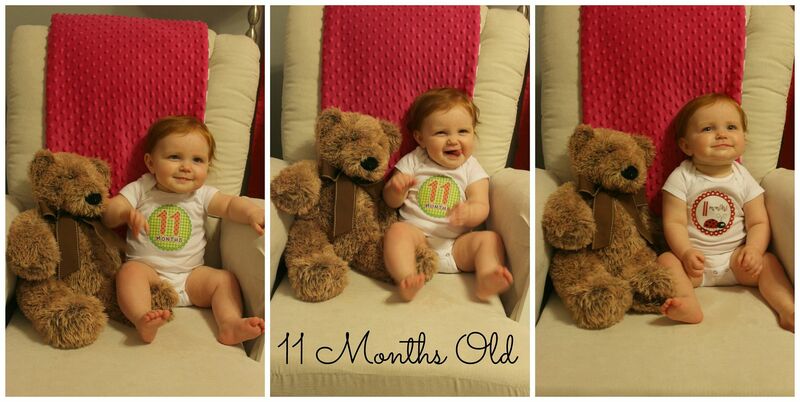 She is getting so big and changing so much and it's all going by way too fast! We are having an awesome time at this stage in Baby K's life and I love watching her explore new things each and every day, but I really do miss the days when she was a newborn and would let me hold her all day long. She would fall asleep on me multiple times a day and I would just melt. Now, she's too busy moving and grooving to take time to sleep in her mama's arms. It is so true - the advice I have gotten from EVERYONE - enjoy it and hold them as much as you want because they grow up way too fast. Stats: Just like last month, not much of an update since we no longer have our home scale and Baby K won't be going back to the pediatrician until her 1 year well check up (God willing we don't have to go before that!). Development: We have a crawler!!! Baby K gave me an awesome Mother's Day gift and started crawling right before she went to bed on May 11. It took her a week to really get the hang of it and understand she could explore all on her own, but now she has it down and cruises so fast. She is in to everything, but luckily hasn't tested too many boundaries...yet. She is also pulling up to stand on EVERYTHING. I don't think she will be crawling long, because this girl just loves to stand (I mean, she's been standing when we prop her up against a chair since she was 3 months old). More often than not, when I go in to get her out of her crib after nap time, she is standing up waiting on me to pick her up. She says Da Da Da Da Da pretty consistently and we are working on helping her understand that DaDa is an actual person. I will ask her who DaDa is, or where is DaDa, and when she looks at Tolar we get really excited in hopes she will eventually understand. We don't have an actual first word, still lots of blabbering and plenty of Da Da Da Da Da. She loves to click her tongue, especially if I do it first. I have no clue where she learned that, but I love it. And she is playing around with her volume and vocal inflection. She is really waving now - still flapping her arms as an occasional wave, but she has mastered moving her fingers for a wave. Loves: This little girl is just like her daddy and loves to drum. And if she isn't banging on her actual drum, she will bang on whatever is in front of her. I love to see her little hands go. This is a weird one, but she loves it if we blow in her face. She will always take a breath in and then get the biggest smile on her face. It's a great way to cheer her up if she is crying. She loves to look at herself in the mirror, she has since she was really little. Its so cute to watch her smile and reach for the mirror whenever she is in front of it. And she also loves peekaboo. Sometimes we don't even have to cover our faces, we can just say 'boo" to her and she will laugh. And recently she started putting her plug (her pacifier) into our mouths and she thinks it is the funniest thing. She will laugh so loud when that happens. And my favorite part - she loves Tolar and I. Whenever one of us walks into the room, she smiles and squeals. It is the BEST feeling ever. Dislikes: Going to the nursery at church - at first. Baby K has started to realize when we arrive at church that she is getting ready to be separated from us and she will sometimes cry before we even enter her classroom. But she always calms down once we walk away and she realizes that her "friends" are there. This child doesn't like to wait on food, if I don't have a bottle or her dinner ready as soon as I put her in the highchair, she will let me know that she is unhappy. Sleeping: She's still a rock star sleeper. We put her down at night around 7:30/8 p.m. and she will sleep until about 7 a.m. with no problems. We are so thankful. She also is pretty consistent with her naps (about an hour to an hour and half each), although she has dropped her third nap and only naps once in the morning and once in the afternoon. Her first nap almost always happens around 10 a.m., but the start time of her afternoon nap is harder to predict. She will lay down for her afternoon nap anywhere from 2 to 4 p.m. Diapers: We are in Pampers size 3 all around. I found a Newborn diaper and put it up next to her size 3 diaper and I could not believe the difference. And to think, Baby K wore Newborn diapers for the first 8 weeks of her life! Eating: She still eats pureed fruit in the morning and absolutely loves it! For lunch and dinner, we are experimenting with all sorts of different foods. She LOVES baked potatoes and Greek yogurt. She also likes corn, black beans, broccoli, pulled pork, cheese, bananas, apples, macaroni & cheese, eggs (both scrambled and hard boiled) and grapes. It is so awesome that she will basically eat whatever we put in front of her. I hope her wide range of tastes sticks around! 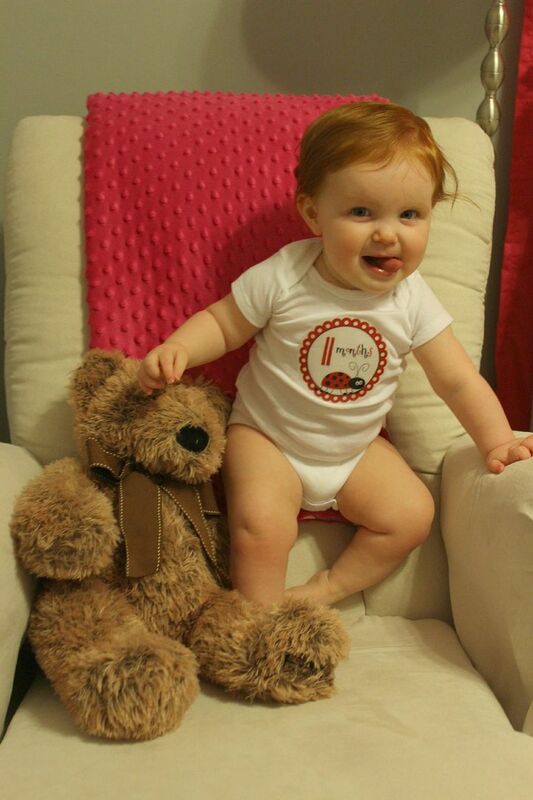 Clothing: She is in size 9-12 and 12 month clothes. I am in love with her summer wardrobe, she has so many pretty dresses and shorts. This girl has better clothes than me! Miscellaneous: Now that Baby K is crawling, we have had to tell her no a few times. She apparently understands what no means because she starts crying when we tell her "no" or "no touch." It's so sad, but I'm glad she understands it! She also has started to be a little shy around new people. When people come up to us at church or out in public and say hello to her, she will nuzzle her head on mine or Tolar's shoulder. It is so cute! It crazy how the time fly's. Baby K is so cute. I hope she will continue to eat what food she will give her. My mother in law babied my brother in law so much. That now he 17 and won't try new things. Drives me nuts. Aw, what a little cutie! I bet time FLIES when they are this age!